Marx’s written output was massive. Much of it remained unpublished in his own lifetime and there is still no complete edition of the extant works, although most have been published in one form or another. This book, first published in 1983, provides an analytical guide to the complex chronological and evolving substantive structure of Marx’s main writings in critical theory. The format is concise and accessible, with each phase of Marx’s evolving critical theory of capitalist society being summarized in a diagram. An invaluable guide for students of Marx, it will lead them through the maze of his works to a potentially deeper understanding of his thought. Allen Oakley believes that, in order to fully comprehend Marx’s critical theory, it is essential to trace its complex evolution. Any serious study of Marx’s critique of capitalism must begin with an appreciation of the bibliographical framework within which his evolving ideas were manifested. 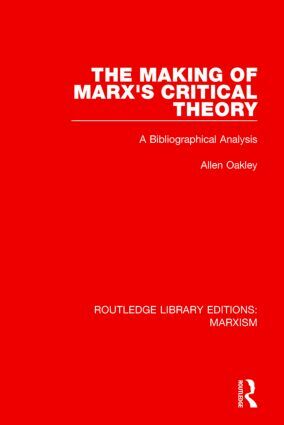 Oakley is opposed to approaches to the study of Marx’s critique which take little account of its chronology; such approaches, he believes, are incomplete and potentially misleading with respect to the meaning and significance of the critique. The book includes bibliographical evidence about the unfinished state of Marx’s critical project and its ever-changing scope and organization. It argues, therefore, that the methodological and substantive status of Capital must be interpreted cautiously, for bibliographical evidence shows it to be an unfinished climax to an ambiguous critic-theoretical project of uncertain dimensions. To read it as in any sense a final and definitive statement of Marx’s critical theory is, the author believes, to be deluded.